We all like doing good things. We all like hanging out with fun people. Here in Northwest Arkansas, these two things have come together for #NWArkCares. I’m part of the Northwest Arkansas Bloggers. We write about all kinds of things and have so many great people in the group. My gal pal, Jacqueline Wolven had the idea that maybe we could use our collective voice and social media power to increase awareness of a different issue each month. Thus #NWArkCares was born! September is Literacy Month and we have some great organizations and campaigns in our area that are trying to help people with their literacy, thus increasing their capacity for education, independence and success. My daughter and I did a little late-summer cleaning and ended up with a couple of bags of books. Thanks to my friend and fellow blogger Talya Boerner, we were able to contribute to the Free Little Library program. The Ozark Literacy Council is a local organization that works, on so many fronts, to improve the area’s literacy. 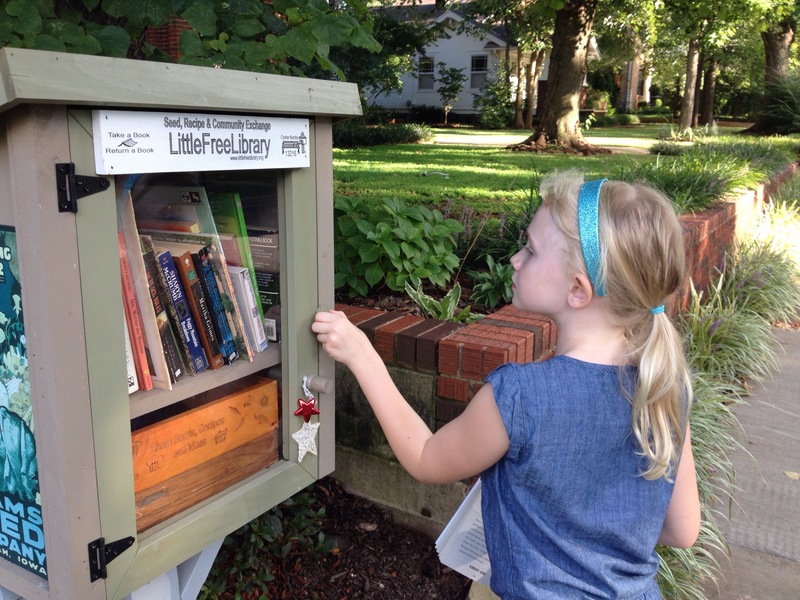 They have been increasing the number of Little Free Libraries, thus improving access to books. Check out some of the great designs from local architects: Ozark Literacy Council. Educate yourself about the issue and find out about groups that are doing good work in your area. Volunteer! These groups need volunteers. School reading programs need volunteers. Local shelters need volunteers. Financially contribute. Put your money where your mouth is. Maybe your neighborhood needs a Little Free Library. Read! Read all the time. Read in front of your kids and to your kids. Recommend books to friends and coworkers. Encourage, challenge. Make us all better. Enjoy the second half of September! I’m a little late to the game for summertime posts. Guess what that means? I’ve actually been enjoying summer! Summer at the Lazy E (our patch of dirt here in Arkansas) is a fun time. There is this magical time in March where pops of color start appearing through the neutral drabs and the grass isn’t growing yet and the ticks and chiggers seem to still be asleep (I don’t think they hibernate, but I feel like they NEVER EVER die) and we walk around the farmette feeling pretty proud of ourselves and thinking that maybe being full-time corporate folks and part-time homesteaders is not that hard…. Then everything starts growing! This year I actually got a jump on things. Let me be honest, my new helper and I got a jump on things. The Lazy E has a farm hand and he is great! He’s a nice, well-mannered junior high kid that has a great work ethic…shocking, huh? With Christopher’s help, we got the garden into shape and all the planting beds ready for April. He spent countless hours hacking back weeds and hauling brush to the burn pile. With his help we’ve stayed on top of the jungle. We also hosted a couple of house/garden parties, so that was a good motivator (strangers coming to the house will do that). Now the Lazy E is in full swing and we are into the harvest period. I make it sound like I pulled the combine out of the barn or am sending steers to market…um, no. 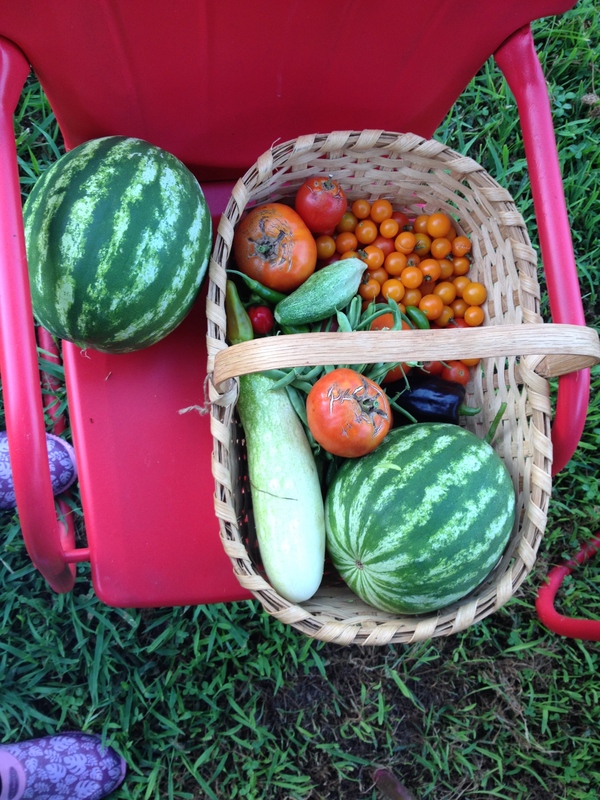 Yesterday I harvested a basket of tomatoes, a handful of strawberries and a gallon bag of green beans. I love my garden. It is great therapy and I get to eat things I’ve grown. If I had to only rely on my garden to feed the family, I’d be very stressed out, but thankfully, I can just stop by the store and pick up dinner if locusts eat all my corn (not sure if locusts even like corn). I hope everyone is enjoying their summer and staying away from the ticks! I hope everyone is as excited about the warmer weather as I am and you are supporting your local farmers and buying all of their yummy produce. My office is downtown so I have the luxury of being able to forward my phone, close a file and walk outside and shop twice a week at our market. It’s a pretty great perk. This week a friend came over to peruse my fabric stash and stayed for dinner. She reminded me that she has a “million” food allergies, so would understand if I wanted to take the offer back. I like a challenge and find that some of my favorite dishes have been born out of a challenge. I had planned on making fish, rice and veggies and loaded up on produce at the market. This included a big bag of kale. As I started to prep, I realized that I had a lot of produce to roast with the fish and maybe I should forego the kale. But we needed snacks! Pinterest to the rescue and the kale chips would be had by all. Everyone loved them, especially the kiddo. So much so, that she asked for them the next day. That’s success in my book. Try them. Let your kids make them. You might be surprised. Remove the meaty spines of the kale and tear leaves into desired size (bigger is more impressive). Wash and dry thoroughly. 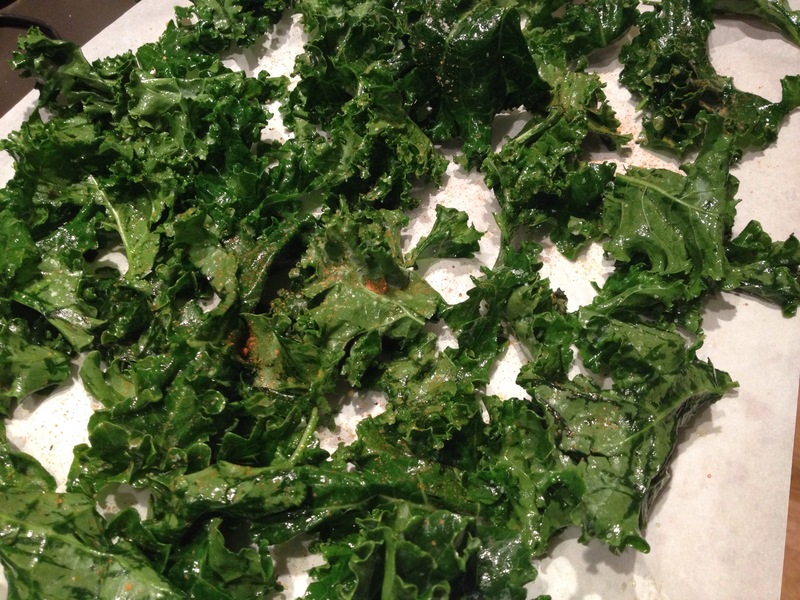 In a large bowl, add kale pieces and a small amount of oil (start with a tablespoon). Massage the oil into all the leaves. Spread out onto a baking sheet lined with parchment paper (very important). Sprinkle with salt and pepper. Jazz them up with cayenne or Cajun seasoning or even cheap sprinkle Parmesan (you know, from the shaker can). Bake at 300 degrees for about 20 minutes. I used the convection setting on my oven and it worked great. Remove from the oven and you’ll have a plate piled high with delicate, crispy goodness. 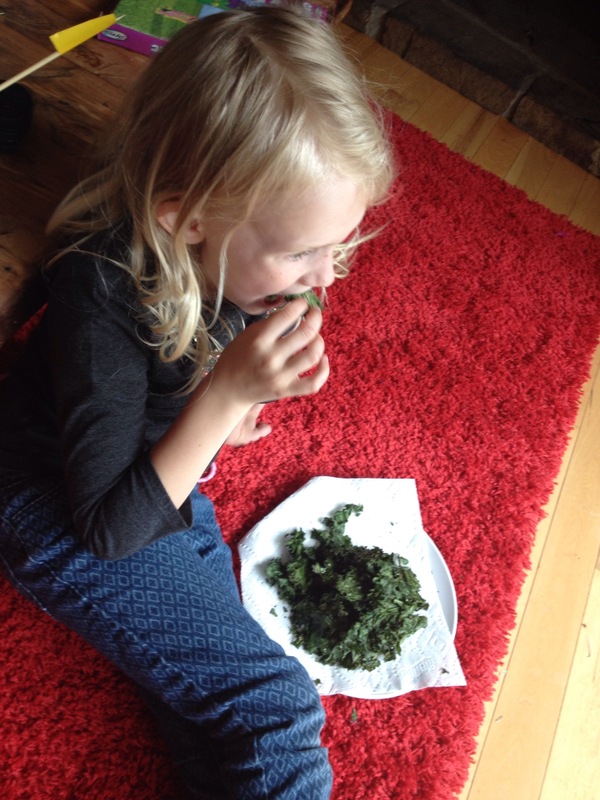 The kiddo in kale bliss. Wait, we have TWO winners! I decided to pick a winner for each palette! I will be coordinating with the two winners to get measurements and go over styles and prefs. Thanks to everyone that entered the contest. Remember, I am available for commissioned pieces, if you are so inclined. In the spirit of Me Made May, here is a photo of my first outfit for the month. The kiddo took the pic and yes, I’m holding containers of fruit. I’ve been making simple, stretchy pencil skirts. I can make them the correct length, they don’t wrinkle and they are a wardrobe staple. The top is $3 thrift store find that I altered down to the correct size. Yeah for Me Made May! More to come! It’s been a while. Work is busy. Family is busy. Ok, who am I kidding? I’ve been binge watching Kimmy Schmidt and Poirot (don’t judge). I’ve been doing some of my favorite sewing over the last week. A friend asked me to turn some of her late grandmother’s night gowns into something for her two boys and two nieces. She chose bunnies and since we are so close to Easter, it couldn’t get any cuter. Making new things out of old things can be a bit of a challenge, but those things are easily resolved with a little patience and planning. I had to piece together the fabric since the pattern I use has you only cutting out four pieces. No worries, that’s easy enough. I monogrammed patches for the bunnies and embroidered the grandmother’s name on one of the ears. All in all, a sweet addition to anyone’s Easter basket. Everyone enjoy the first week of Spring! My next posts will be about our family adventure. 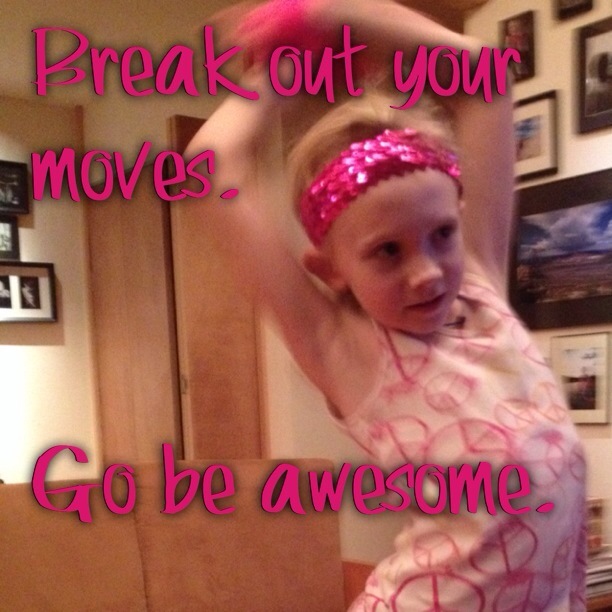 Sometimes a dance party just happens at our house. I don’t know why we don’t have one everyday.